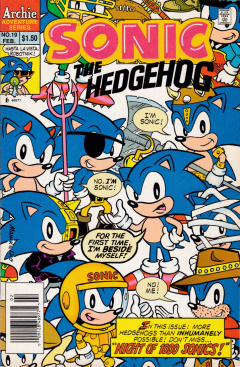 Sonic the Hedgehog 19 is the nineteenth issue of the Sonic the Hedgehog comic series. It was released in February 1995. This comic features one story: Night of 1000 Sonics!. While strolling along, the Freedom Fighters come upon a large dimensional portal. While wondering what it is, a being pops out, forcing Sonic to push Sally Acorn out of the way of the portal. Sally looks over at the being, who is an exact duplicate of Sonic, just with half his head roboticized. The Cyber-Sonic gets up and identifies Sonic as a target and goes after him, but Sonic tells him to slow down. This duplicate confuses Sally, though Sonic figures out where it has come from. He recalls his previous trip through the Cosmic Interstate, where he met his evil twin, Evil Sonic. With this in mind, Sonic realizes there could be numerous forms of himself. The Cybernetic Sonic, after listening to Sonic's theory, describes his universe to the Freedom Fighters. He recalls his world, where Robotnik successfully captured and roboticized their Freedom Fighters, but incorrectly. He only half-roboticized them, making the group stronger than before nd allowing them to storm Robotropolis. Before they could confront Robotnik, he roboticized himself and destroyed the Freedom Fighters. To defeat this stronger Robotnik, Cybernetic Sonic took to the Cosmic Interstate to find allies, as Robotnik threatens, not only his Mobius, but all universes. With a supreme threat coming, Sonic and Cybernetic Sonic both take numerous trips along the Cosmic Interstate and gather up a whole load of alternate Sonics to take on the roboticized Robotnik. Sonic takes to the stage and announces the crisis to all the Sonics in his audience. He bands the group together, just as their new nemesis, Robo-Robotnik (the head of Robotnik, but roboticized), arrives through the trans-dimensional portal with many advanced Shadow Swatbots. In Robotropolis, Dr. Robotnik watches as Robo-Robotnik announces his intentions to take over all universes. Robotnik gloats to Snively, thinking the being is just attempting to copy him. He presses a button on his chair and commences an attack on Robo-Robotnik's forces. With flying vehicles, he sends his own Swatbot forces to take care of Robo-Robotnik's Swatbots, intending to prevent him from taking over his universe. Robotnik's forces succeed, and destroy the Shadow Swatbots as Robotnik arrives to confront Robo-Robotnik. He orders Robo-Robotnik to leave, declaring that this is his universe. Robo-Robotnik obliges after his defeat, but promises that he will return. With Robo-Robotnik out of the way, Sonic and his forces decide to change their focus to Robotnik himself. Before they can go after him, Robotnik tells the Sonics that Robo-Robotnik would never give up so easily, and that he and the Sonics should combine forces. Despite being enemies, they agree. They get together around a table, Robotnik's forces and the Sonics, to develop a plan. Aside, a massive muscular Sonic wonders why everybody is talking and why they don't let him do the job with his strength. As he thinks, four small Sonics run by, who the large Sonic tries to crush. Despite his strength, however, the four Sonics work together and knock him over. Sonic Prime looks over and tells them to knock it off as Robotnik begins telling his plan. Robotnik, thinking like his counterpart, recalls a weapon called the Giant Hand, an alien weapon of massive power located in the Neutral Zone, thinking that he'll go after it. A whole group of Sonics, including Sonic Prime, go into the Cosmic Interstate to locate the weapon. Unknown to them, Robotnik plans on using the Giant Hand to allow him to rule all. Robo-Robotnik, now back in his full body form, watches from his lair as Robotnik allies with the Sonics, to his amusement. He has a plan up his own sleeve, pressing a button on his chair. Aside, a being is transported into the lair: Evil Sonic, Sonic's old nemesis from another universe. Evil Sonic demands to know where he is, as Robo-Robotnik tells him that he is at a place where he can put his evil to good use. He goes on to tell Evil Sonic his plan. The Sonics travel along the Cosmic Interstate, until they reach an intersection with many forks. Sonic Prime stops instantly, causing the whole group to crash into each other. They look around, but can't figure out which way to go. Thank goodness for Robotnik, they received a map, but the map points to where no paths lead. He recalls that Robotnik said the path bordered the neutral zone, so he takes a leap of faith, and steps into the void where the path is supposed to be. His suspicion is right, and he walks on air along a hidden path into the Neutral Zone, which is devoid of any color. They look around, until Sonic discovers the Giant Hand: a large metallic glove. He picks it up, but before he can figure out what it does, he is knocked over by an unknown force. The group look back at the path, only to see Evil Sonic with a group of Shadow Swatbots. The Sonics, through teamwork, rush at the Swatbots and take them out together, leaving Sonic to take care of Evil Sonic. Evil Sonic had swiped the Giant Hand from Sonic earlier, so he starts to run away, with Sonic in pursuit. He catches up to him and knocks him down to the ground, causing him to drop the Giant Hand. As Sonic prepares to take care of some personal business with Evil Sonic, he looks over as the Giant Hand disappears in thin air. Evil Sonic informs him that Robo-Robotnik had tracked the Giant Hand and transported it right into his lair. He laughs maniacally as he walks over to the glove and presses a button it. It grows and encases Robo-Robotnik inside a giant humanoid-shaped robot that he calls Giant Borg, that he will use to wipe all the Sonics out. With Robo-Robotnik in control of the strong Giant Borg, the Sonics are upset over their possible imminent loss. Sonic, however, is still confident that they can win. Despite this, the Sonics start blaming each other for losing the Giant Hand. Sally breaks them up, pointing to the four small Sonics and how, despite their size, were able to take down one of the strongest members of their group. With renewed confidence, the Sonics decide to take on the Giant Borg as a team, despite the size differences. The Sonics catch up to Robo-Robotnik, who is wreaking havoc around Mobius. Despite initially being intimidated by the size of the robot, they work together and climbing up it. Robo-Robotnik, however, is not phased and throws one of the robot's arms down, throwing many of the Sonics around. With some of the Sonics down and out for the count, the Giant Borg lifts a leg up to squish them. Taking advantage of the opportunity, Sonic orders the others to make their move with everything they got. All the Sonics spindash into Giant Borg, overwhelming it and knocking it over. It crashes and breaks up into many pieces, including Robo-Robotnik himself. As the rest of the Sonics recover, Sonic finds Robo-Robotnik's head, however, Cybernetic Sonic swipes it out of his hands and takes him back to his dimension, claiming he won't be back. Aside, Robotnik looks at the broken pieces of Giant Borg, realizing they are interlocking pieces and that he could rebuild it. His plans are foiled from the start, as the other Sonics gang up on him. After hearing Robotnik, Sally realizes that the Giant Borg could reform due to the interlocking pieces. Sonic gets an idea, and gives a piece of the robot to each Sonic, to prevent it from forming again. Sally is unsure if they can be trusted with the pieces, but Sonic believes that if he can't trust himself, he can't trust anybody. Robo-Robotnik, later to become Dr. Eggman, one of the primary antagonists of the comic, is introduced. This is the first issue which focuses on one story. The other Sonics shown include an astronaut, a mummy, a pirate, Batman Sonic, a joker, a massive muscular Sonic, Indiana Jones Sonic, a samurai, a cavehog, a gambler, a military officer, a diver, a Viking, a member of the Beatles, Wolverine Sonic, a farmer, Robin Hood Sonic, a dazed boxer, a chef, a wizard, a hobo, a musketeer, a skier, Sherlock Holmes Sonic, a sailor, a Frenchman, a tennis player, a military general, a surfer, a weight-lifter, the Human Torch, Thing, a hockey player, Santa, a devil, a professional with a top hat and four small Sonics. Evil Sonic arriving in Robo-Robotnik's lair is similar to that of the time transport bubble shown in The Terminator series of movies. The Princess Sally mini-series is officially announced in Sonic-Grams.